Many thanks from both of us. Very much appreciated the quality of your guiding. Made for a great day out on the water, in fact the best for quite a while. “These kings show no mercy on neither angler or his tackle! A great day out, great guide, brilliant and reliable tackle and simply an awesome species on fly gear”. Thanks for forwarding the pictures on from a great day of fishing yesterday. 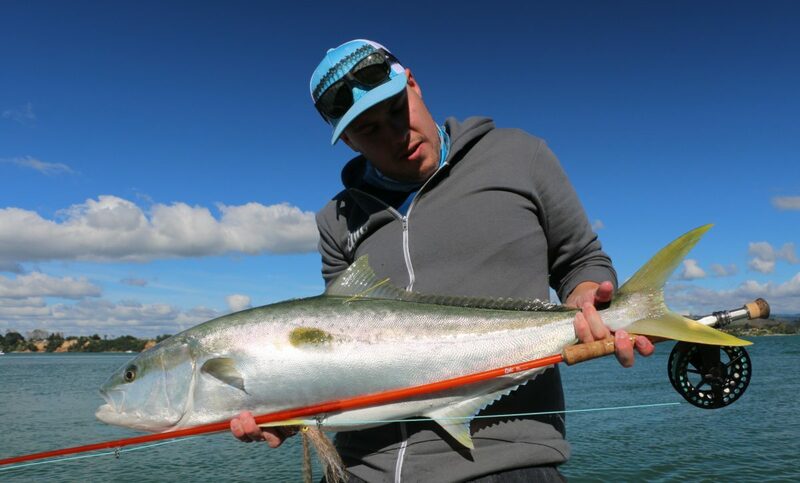 Salt water fly fishing and hunting for kingfish on the Tauranga harbour matched other fishing experiences around the world and feel you have a great fishing ‘product’ that will provide memorable moments for anyone who chooses to fish with you. Excellent price point and exciting. Lucas, thanks for a great day, wish we could have chased those flats Kingis all week. Fantastic late season fishing, really appreciated your focus and energy in finding us some fish in what was a short day. Will be back to book some full days with you as the water warms back up. Very generous in sharing your knowledge of this amazing fishery. Fantastic operation, and what a great great fishery, probably one of the best places on earth to consistently target ray riding kingfish. Lucas is a very professional, friendly and patient guide who knows his stuff.